Washington, DC - Reaching a peace agreement between the Israelis and Palestinians was identified early on as a key Trump administration objective in the Middle East. His peace team, led by his son-in-law and senior adviser Jared Kushner and special envoy Jason Greenblatt, worked toward achieving the "ultimate deal" in several rounds of separate discussions with Israeli and Palestinian leaders, as well as other regional stakeholders, such as Jordan, Egypt, and Saudi Arabia. In a recent interview with a Palestinian newspaper, Mr. Kushner indicated that the Trump administration would soon be ready to "air the plan publicly" if Palestinian President Mahmoud Abbas refuses to come back to the table. The peace plan is expected to contain detailed proposals geared towards solving the core issues in the dispute, such as borders, Jerusalem, the fate of Palestinian refugees, and security arrangements. Although President Trump and Israel's Prime Minister Benjamin Netanyahu have indicated an openness towards a one or two-state solution, the plan under discussion is believed to be geared towards a solution in which a Palestinian state is created alongside the state of Israel as the culmination of a quarter-century of diplomatic efforts aimed at solving the conflict. 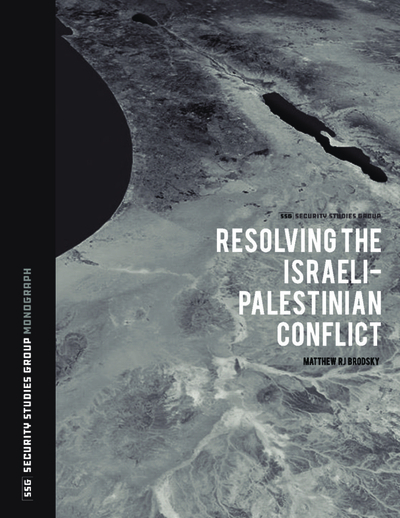 With that in mind, the Security Studies Group (SSG) is pleased to release a monograph that details the evolution of the conflict's core issues and tracks their treatment in the three previous U.S.-led negotiating efforts that led to offers to end the dispute. Entitled, "Resolving the Israeli-Palestinian Conflict," the SSG also offers what it believes could serve as a negotiating framework for a final status agreement that meets the goal of two states for two peoples with a Palestinian state for Palestinians alongside a secure state of Israel recognized as the nation-state of the Jewish people. Beyond the scope of the suggestions herein is a reality in which Palestinian politics and the potential territory that could become part of a Palestinian state is divided between Fatah and the PLO in the West Bank and Hamas in Gaza. The latter has been a U.S.-designated foreign terrorist organization since 1997. This political and ideological stalemate highlights the importance of external support from other regional actors and crucially, the Palestinian people themselves who will need to overcome their own political divisions and empower leaders to make the sacrifices necessary for peace. As Mr. Kushner recently told Al-Quds, "Without the people pushing the politicians to focus on their needs and giving them the courage to take a chance, this will never be solved." The monograph is on our website and available for download as a PDF. Adam Kredo of the Washington Free Beacon has a preview and a few quotes in his article, "Trump Admin-Tied Group Presents Plan for Israeli-Palestinian Peace." Tal Schneider of Globes covers our plan in Globes (Hebrew), "A Kushner Trial Balloon? A Palestinian State in 95% of the West Bank." Please feel free to contact me with any questions, comments, interview, or speaking requests.